We write novels, sing songs, build homes all for love. Give her a simple, everyday reminder of your love with this sweet Sydney Evan pendant necklace. 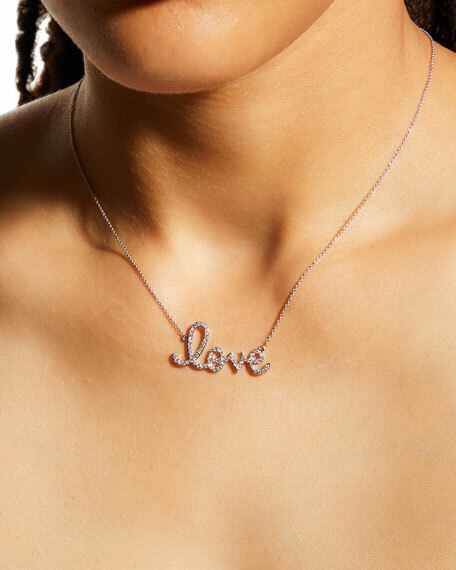 Integrated "love" script pendant with glittering white pave diamonds. Celestial medallion necklace from Sydney Evan. Polished 14-karat yellow gold hardware. 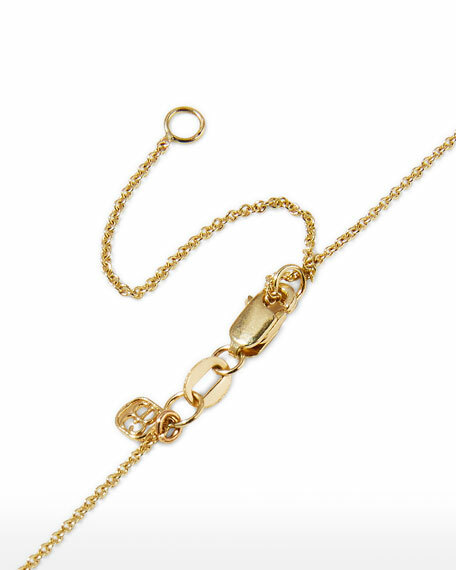 Cable chain with scalloped-edge drop. Diamond pav?? crescent moon and star. Approx. 18"L; 5/8"H x 5/8"W drop. 0.026 total diamond carat weight. Lobster clasp. Imported. Sydney Evan flower, bird and peace trio pendant necklace. Polished 14-karat yellow gold hardware, chain and settings. Diamond pav?? hummingbird; multi-sapphire pav?? peace sign. Single yellow gold flat daisy pendant. Approx. 16"L with 2" extender. 0.09 total diamond carat weight. 0.09 total sapphire carat weight. Imported. Sydney Evan heart, stiletto and lips trio pendant necklace. Polished 14-karat yellow gold hardware, chain and settings. Ruby pav?? open lips pendant; diamond pav?? stiletto drop. Single yellow gold flat heart pendant. Approx. 16"L with 2" extender. 0.14 total diamond carat weight. 0.18 total ruby carat weight. Imported.